My experience with this product is a very present one. It is very easy to use, I did not even need to read the user manual. Though I read online, some people had connection issue when setting up the wifi. However, I personally did not experience that problem. Just follow the app instruction when you add the device. I only downloaded the Smart Nursery app, plug in the device, added the device on the app, connect to Wifi and it was up and running. This machine is a part of the Motorola smart nursery system, so you can add various smart nursery products to the app. The app will show the temperature and humidity of the room. You can set sound detection/trigger; where you can set to turn on the mood lighting, music or projection when it detect sounds. Make sure your phone volume is not at max, I felt it works best when volume is at the middle. Moreover, you have control over audio monitoring, projection, music and light via the app. You can set notifications to your phone when sound trigger the device or the temperature/humidity are not within your range setting. does plays the music in a loop until you turn it off, or when timers goes off. I do not think the limited music and image are the deal breaker. I think the machine is a really good white noise machine for the baby. However, hopefully they will allow people to download more songs/sounds in the future. I give the product a 4/5 rating. The only reason i did not give it a 5 stars is I experience audio monitoring issue. When I experience issue with the audio features, where there is an echo sound when I tried to listen or talk via the app and device. I called Motorola's customer service and their customer service rep is very good. We trouble shoot together and she offered solutions. I will give their support team a 5/5 because she is very professional and really listened. 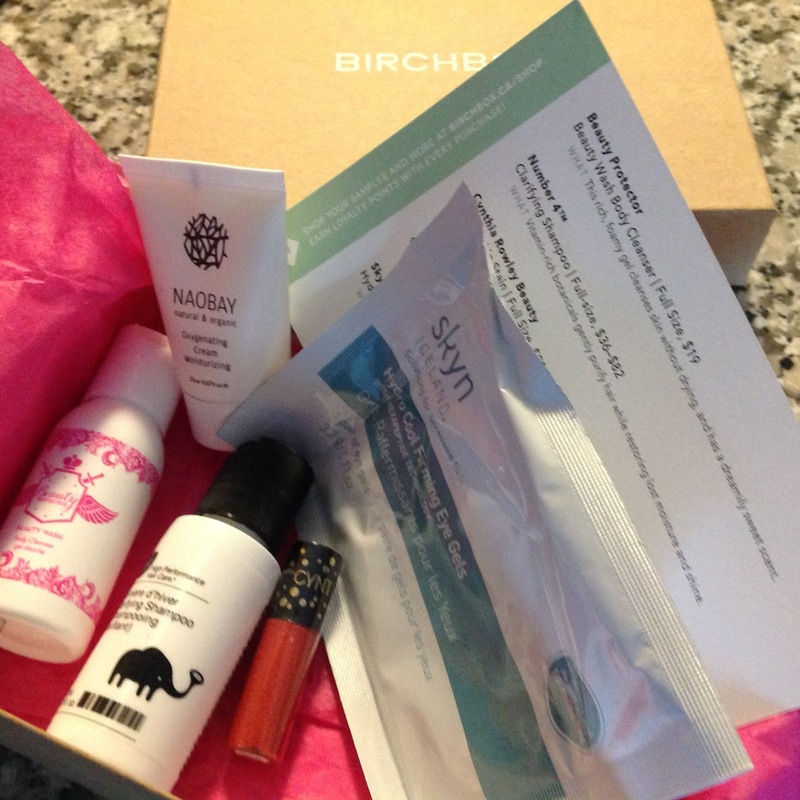 This is my first Canadian Birchbox. I have ordered the USA version before via a friend's address. I think it is almost the same. The Canadian version cost a little more because of the extra shipping cost. Number 4: Clarifying Shampoo - haven't try this one since I am not a fan of trying new shampoo that do not come with conditioner. Also I really like my Ryo shampoo and rinse... therefore, I am not changing shampoo for awhile. Naobay: Oxygenating Cream Moisturizer - I like this cream; its hydrates my skin. Skyn Iceland: Hydro Coll Firming Eye Gels - this is my favorite product in this box. As usual I am disappointed in the mystery box. I am not sure why I keep buying them. Damn the 1 colour that always lure me in spending the money for it. This box cost $24.99 USD. For sure the item inside the box worth more than $24.99 but I do misses the old days when it was under $20 for a mystery box. This time the mystery box came in a HUGE box. Since the weight was so little, I figure it was fill with paper filler, and it was. I used a promo code to get the Pile Wand free since my last one decided to fall apart. Yes the glue that glue the wand together just decided to stop working. Inside the box there are 5 polishes, 1 fluid eye glider (in black), and 1 luxe up your lip tinted conditioning lip treatment. The nail polish colours are - Corinne, Brandy, Brenna, Jess, and Margot. Brenna is beautiful! I cannot wait to try it. I have not try their fluid eye glider and since I am not a makeup person, I cannot give much comment on it. The Luxe up your lip tint - I really dislike this product because it separates. Not sure if this happens to anyone else. The product inside just separate and the colour will faint with a very odd smell. It happened to me twice already. 1st time, I was thinking I must have opened and the product must have expired on my desk. So I ordered a 2nd one but soon after I received it, without even opening the product, it separated as well. It have been awhile since I wrote a blog post. So I decided to start off with products that I finished in September. Well the last 2 weeks of September. I will start from the top left corner of the picture. Dewytree Aqua keeper panda mask: yup the mask have a panda pattern. That is the reason I purchased it. The size of the mask is a little smaller than the average Korean mask. It works great, but I think it was not worth paying the extra for the panda pattern. Dewytree honey moist black sheet mask: I love this honey mask. It's simple. 20 min on my face and it fixes all my dry and redness issue. I usually put it on my face before I go to sleep and I always wake up looking great even with little sleep the night before. I always keep extra one in my mask box. Body shop honey & oat 3in 1 scrub mask: the mask smells great but it is a messy face mask. I find it hard to clean up for a facial mask. Therefore I have used it as a body scrub instead. I will most likely will not purchase this again. Julep luxe care hand cream: honestly I haven't finished this product but I think it expired already. I have always loved julep products .. Even when there are times I did not like their customer service and I find it crazy that their skincare/body product are usually not full. Note, their customer service have improved a lot. It's just I remember the old times. Anyhow, I got this hand cream as a set with some oil of them. Yes that expired too.. Smells pretty bad when I tossed it. I remember this product did worked and there was a time I liked it. However, it isn't something I will purchase again. Body shop papaya body butter: I really really love body shop products. I like most of the smells, plus I think their stuff really works. Like half of my shower and body products are from them. It is something I will buy again in a sale. Kiehl's midnight recovery concentrate: to me this product reminds me of the Korean facial oil but with a much higher price tag. I am glad I got this as a sample. Mac amplified cream lipstick: I love this lipstick. It stays on great and it never tries up my lips. I usually get their lip gloss from this brand.. It's more like the only makeup I uses are lip products. I am a big believer that less is more and I am too lazy to wake up earlier to apply makeup. 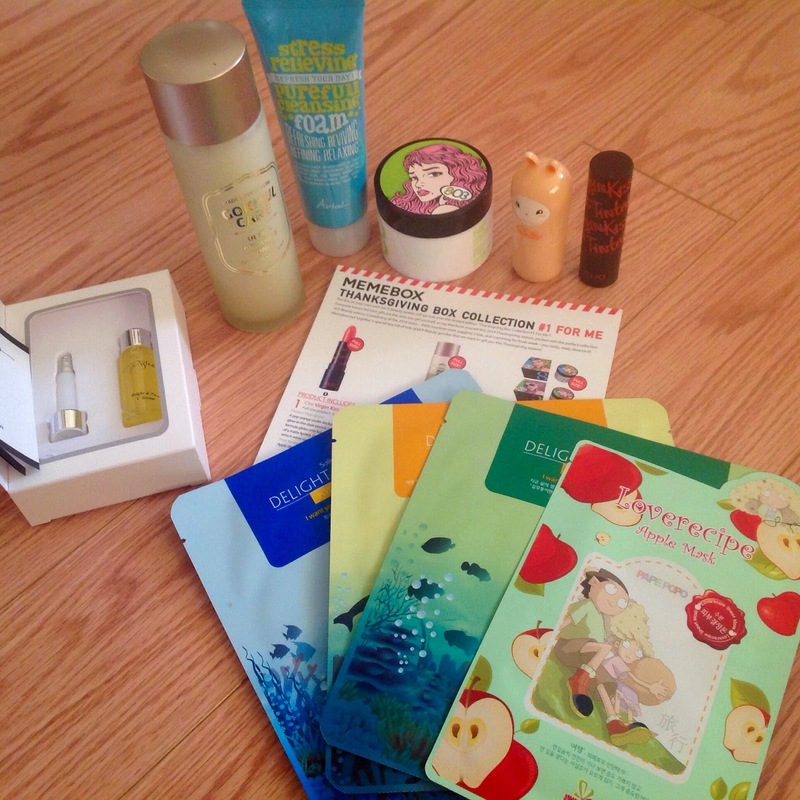 The face shop hwansaenggo gold cream: this cream is very rich and have a strong herbal smell. I don't mind this smell as long as it works.. Since it works.. Yeah! It's something that I will be willing to buy a full size. Missha all around safe block 50: non grasses plus have a high spf. I used the sample on my face and I feel it works great. It have a higher spf than my innisfree one. So I might consider switching to this after my bottle is done. Mizon water max aqua gel cream: I did like this sample from roseroseshop. It is for sure something I will look into buying in the future. Innisfree volcanic nose pack: I have an habbit of using nose pack once a week and this one of often my go to one. It is easy to find online, works great, good price. HolikaHolika good cera super cream: it's an average cream, not something I will buy a full size. DermaLift intensiderm Aqua rich cream: it have a light blue colour but goes on clear. Helps with my dry ski for sure. I really like it, but I cannot find a place that sells it. As I am waiting for my moroccan mint tea to cool down a little, I decide to post some spoiler and a little review for some of the boxes that I have yet have a chance to review. 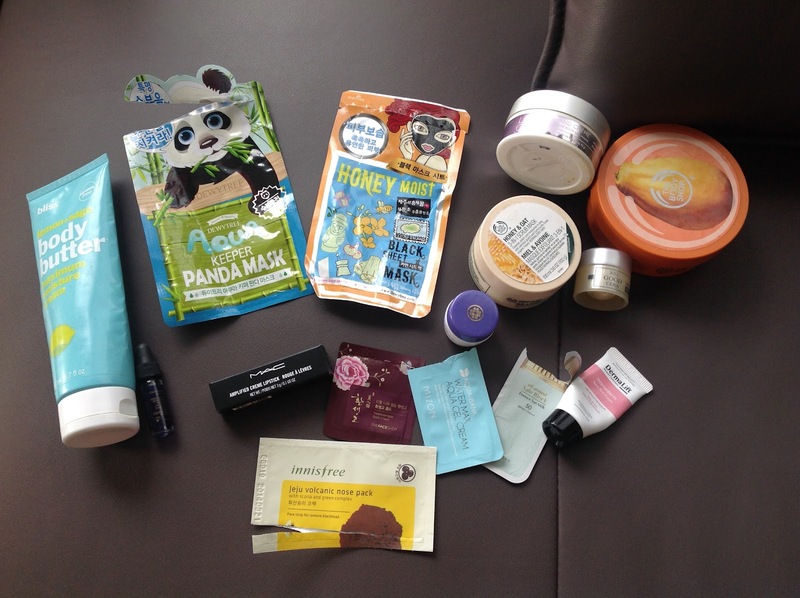 I recevied this box awhile back, and I was hoping some kind of skin care instead of such a heavy makeup and 1 hair product box. Color World Settling Powder - Honestly, I do not notice much difference after using this powder. 2nd Thanksgiving box is meant to be for me to give to someone else...However, since I am the only weird one that I know. The one that tries on all Korean Skin Products.. I guess this box is for me as well. 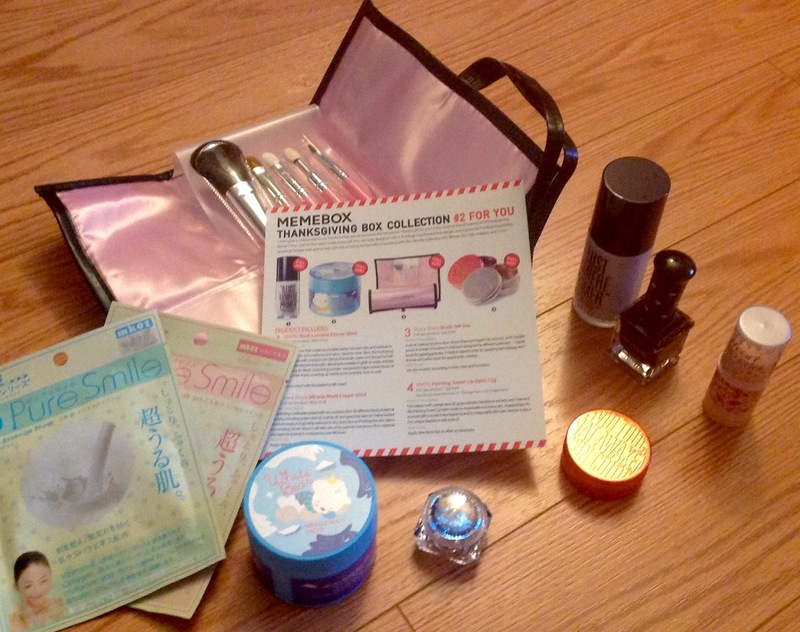 Shara Shara Brush Set: This set is better than I imagine. nothing fall out when I tested the brush so far. shyan Nail Lacquer: base on your luck, you will end up with 1 of the following colour - Blue Violet, Neon Green, Pink Lady, Neon Purple. I am lucky to get my favorite colour purple. Pure Smile Essence Mask Sheet x 2: These mask smells very nice and for the price it is great. 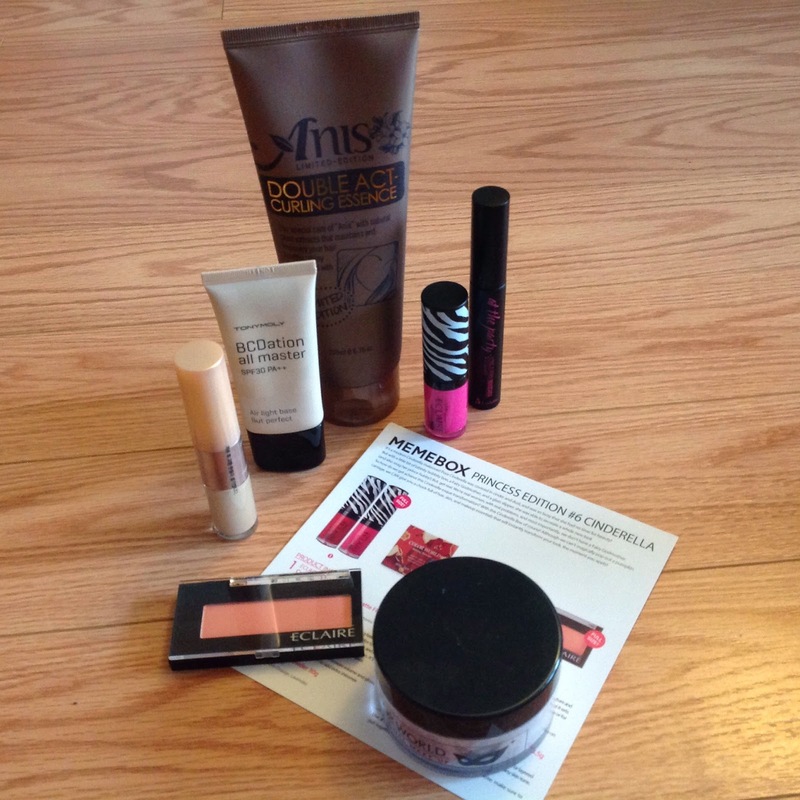 Even though I have already celebrated Canadian Thanksgiving last month, I decided that I can also treat myself to a American Thanksgiving treat by getting the Thanksgiving Box Collection from Memebox. Both boxes are a lot better than what I expect. The bundle costed $52 USD plus $6.99 shipping. It is a great value. Clio Virgin Kiss Tinted Lip #22 Electric: It is a very bright orange lipstick. Not sure if I can pull it off. LOL! Jaminkyung Cokmul Care Ultra Ampoule Toner: this is a unique toner that blend whole grain and camellia oil. Sounds amazing, can't wait to try it. 803 Cream: I was really lucky to get the Neck cream instead of the booster cream for my body parts... Depending on your luck, you might get 1 of 3 903 cream; Palzza Cream, Sam N Cream and Young Cream. Palzza Cream is to firm up cream for smile lines (facial cream). Sam N Cream is the one for neckline. Young Cream is the booster cream for body. Sally's Box - 3 gel masks and one regular sheet mask. The gel mask is a 2 piece mask, which I like a lot, but I know a lot of people dislike it because it is harder to keep it on your face. Tonymol;y Hello Bunny Perfume Bar: I find this perfume bar a little too strong. I can clearly smell sandalwood, musk, rose, but I can't smell the lemon citrus. Personally I like perfume with a sweater smell. Ariul Stress Relieving Purefull Cleansing Form: this is another foaming facial cleanser. Pisteo Bright and Pure C Serum: This is a sample size because the full size suppose to have 4 bottles and I was really surprised by the price tag of $100. It is a Vitamin C concentrate serum.